The list of commercial spin-offs from spaceflight is set to include a new development in advanced underpants. 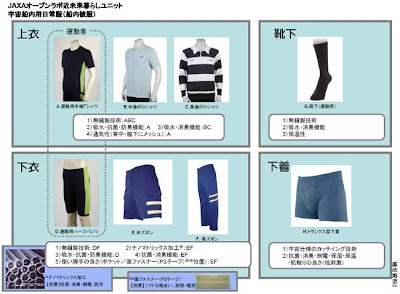 As reported by various media over the past few months, Japanese astronaut Koichi Wakata has been trying out new space-undies that kill bacteria, eliminate odour, absorb water, insulate the body and dry quickly. Like any good action undergarment they are anti-static and flame-resistant, but now you can enjoy these safety benefits for a full week without the inconvenience of changing underwear. Best of all they won't freak out your girlfriend - according to the pics they're stylish enough for the most sophisticated space cadet. It's interesting which space news items get picked up by mainstream media. Missions come and go with barely a mention, but if you invent some futuristic underpants you'll make the front page. Although I find this a little frustrating at times, I don't mind too much because it does generate interest and provides some much-needed lightheartedness in space-related news. And I suppose the ever-worrying issue of smelly undies is something the public can relate to. Anyway I'm still wondering... assuming these things do make it to shop shelves, who exactly will be the target market?